Streamlined deployment and configuration, 10x improvement in time spent on operational tasks and comprehensive support for API-First strategies. 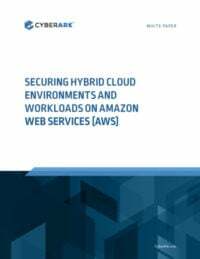 Accelerate security in the cloud, automate DevOps secrets management, and help prevent privileged attacks at the endpoint. Secure and manage local administrator accounts for endpoint devices on and off the corporate network for both Windows and Mac users. Extend rapid deployment of CyberArk Privileged Access Security Solution to Azure hybrid environments within ~10 minutes. Integration with AWS CloudWatch automates the on-boarding of credentials — reducing the risk of unmanaged credentials in elastic compute environments (including with Auto Scaling) and enabling security teams to save time and focus on mitigating potential threats. Integration with Ansible, a leading orchestration tool, and CyberArk Discovery & Audit (DNA) improves and simplifies security of CI/CD pipelines and DevOps environments by automatically finding hidden credentials. Guard against privileged attacks at the endpoint with new cloud-based Application Risk Analysis Service, which enables timely, well informed privilege and application control policy decisions. The Best. Just Got Better.